Sometimes I feel like a kitchen wizard. 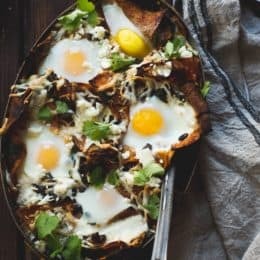 Everything I make turns out just right, whether I’ve followed a recipe to the letter, made infinite tweaks, or just created something off the top of my head. 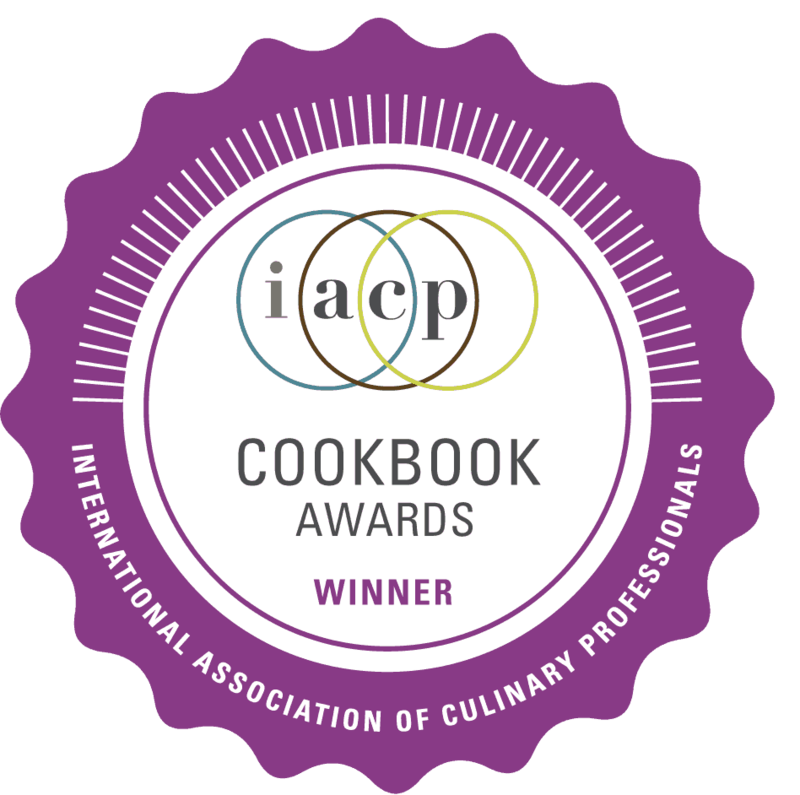 At those times, it feels as though I have a culinary fairy godmother watching over my oven and zapping everything into perfection. But some weeks, nothing I make turns out quite right. I don’t know whether this is just my perception, coincidence, manifestation, or if there is some sort of weird kitchen juju afoot turning everything bland, or dry, or crumbly. This has been one of those weeks. I’ve made half a dozen tasty things, all of which I want to tell you about, but none of them are just right. There were one-bowl chocolate cupcakes, brushed with espresso rum syrup and dipped in rum ganache; but the ganache broke and never fully came back together, despite adding more liquid (and then more chocolate when it didn’t set, and then more liquid when it broke again). There were the macaroons that I sandwiched with the broken ganache to get rid of it, but I didn’t like this macaroon recipe as much as another I’ve made in the past. There was shaved asparagus fettuccine with goat cheese and herbs, but the shaved asparagus seemed stringy; I think it would have been better slivered. I made a vermillion strawberry-rhubarb compote laced with vanilla bean and ruby port, and served it with a ricotta cheesecake that tasted great, but had a somewhat cottony texture due to the whipped egg whites folded in at the end. There was a batch of spicy cardamom-honey granola, but it looks just like the stolen granola, and I plan to remake it with pistachios before giving it it’s own post (though for now I’ve added the variation to the original post). Finally, there was a very involved chocolate babka, which, after hours and hours of kneading, rising, assembling, baking, and cooling, tasted over-proofed, heavy and salty (though, of course, I still ate it; I mean, we’re talking chocolate babka, here). So today I’m giving you the best recipe I’ve got. (I tried to do it yesterday, but Blogger’s been in ‘read-only mode’ while they fix some bugs – glory be!) 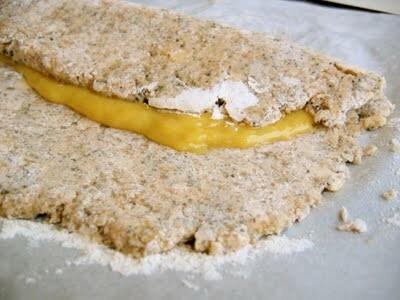 It’s a poppyseed mega scone, inspired by Heidi Swanson, slathered with meyer lemon curd made by a friend. 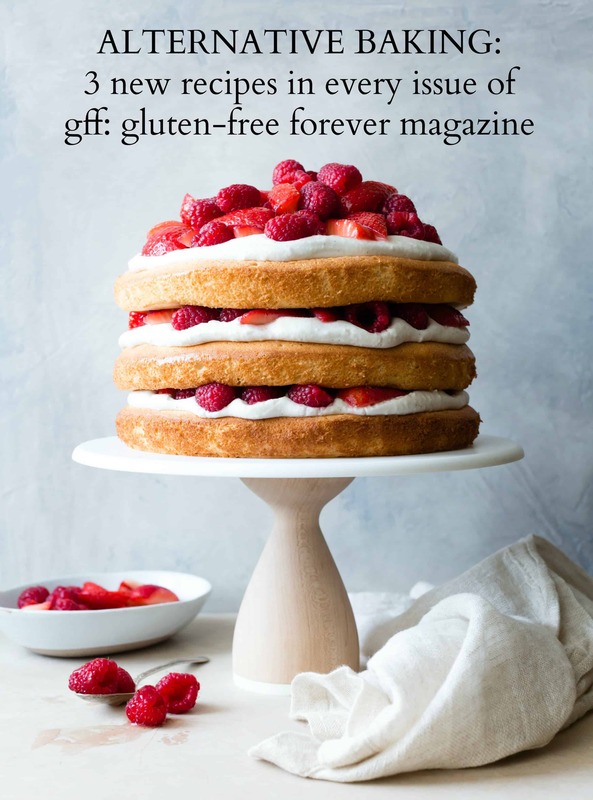 The scone dough consists of all-purpose and whole spelt flours, half and half instead of heavy cream to make them a touch less rich, poppy seeds and vanilla, as well as the other usual scone suspects. The dough is rolled out into a large rectangle, the middle third spread with the curd, and the whole thing folded into thirds like a letter. The slab is baked whole, and the baked mega scone gets sliced into whatever shapes you like. Crunchy edges contrast with the pocket of creamy curd within, and the crisp seeds exude their very unique flavor. There is something so satisfying about making a dough, rolling it out, spreading it with something, and then rolling it up and baking it, as for cinnamon buns, or that pesky babka that I will try again, or this crazy thing that I can’t stop thinking about. Making these scones satisfied that itch. I only wish they didn’t crumble quite so much when cut, but those browned bits that like to flake off are the best part; consider them your reward as the scone-cutter. 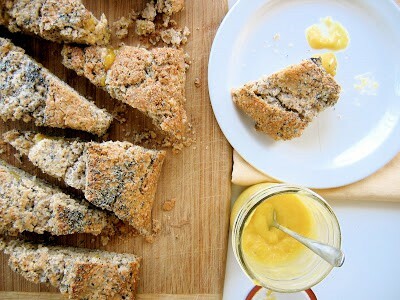 So while these scones may not be perfect, with a spot of extra lemon curd, they do make a perfectly lovely breakfast. ‘cause I’ve got some baking to do. 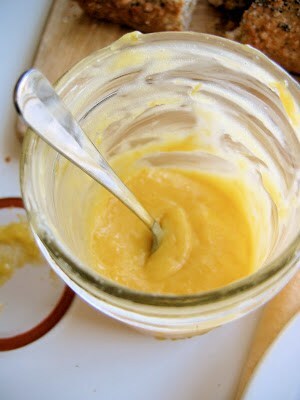 For the lemon curd, use the generous recipe posted here,or use my smaller recipe, with or without the lavender, posted here. Or get the store-bought stuff; the scones will still rock. 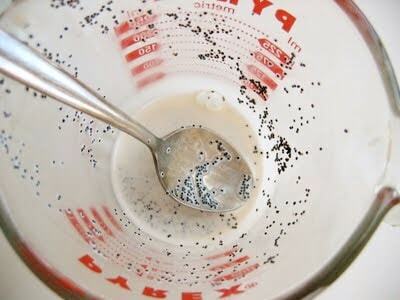 Combine the poppy seeds with the half and half, and set aside in the fridge while you get the rest of the recipe together. Position a rack in the center of the oven, and preheat to 425º. Stir the vanilla into the half and half, and drizzle the half and half mixture over the flour mixture a little at a time, scooping up the poppy seeds from the bottom and adding them in, tossing the mixture with a rubber spatula or wooden spoon, and eventually with your hands, until the scone dough just comes together and no floury bits remain. You may need to add an extra drizzle of half and half, but try to keep the dough on the dry side; it will be easier to roll out, and will bake up crisper. 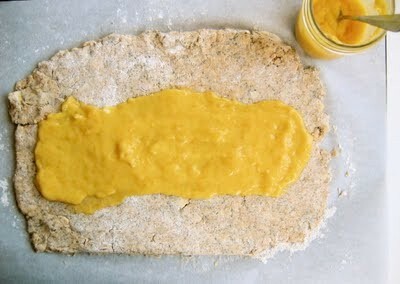 With a long side of the rolled-out dough facing you, spread 1/2 cup of lemon curd evenly over the middle third of the dough, leaving 1/2″ boarder on either side (see photos in post, above). Fold the bottom third of the dough up over the curd, like folding a letter, then fold the top down. 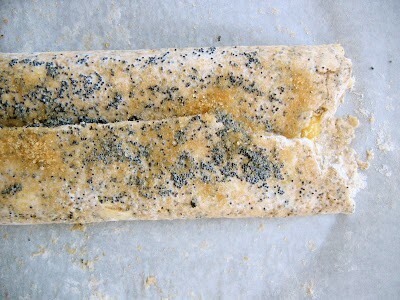 Brush the top and sides of the dough with more half and half, and sprinkle with poppy seeds and coarse sugar. 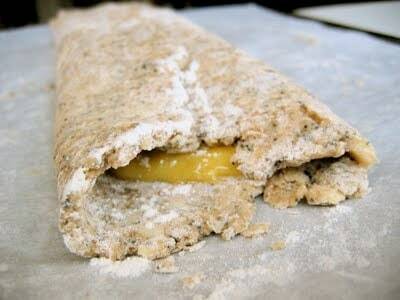 Slide the scone and its parchment paper onto a baking sheet. 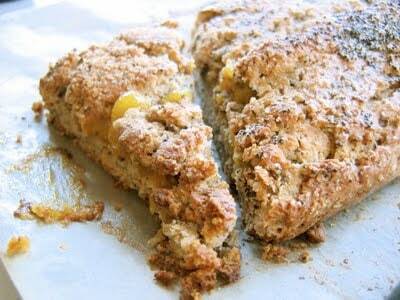 Bake the scone until golden on top, and the curd is bubbling, 25 – 30 minutes. 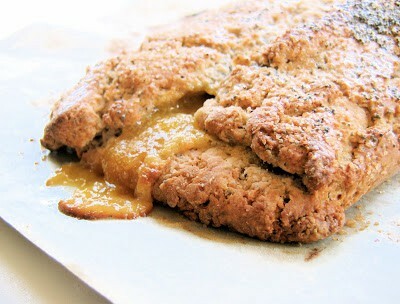 The scone may crack in places and reveal its yellow interior. 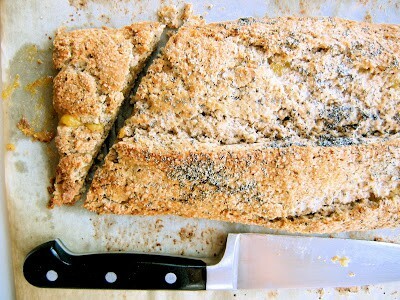 Let the scone cool completely before cutting it into bars or triangles. 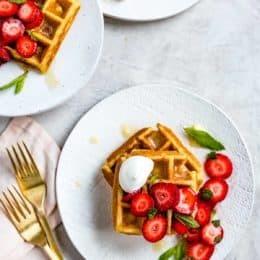 Serve with additional lemon curd. The scones will keep for a few days in the fridge. Heat them in a 350º oven or toaster oven to crisp them up a bit. Hello… NOW I know why our comments to each other weren't showing up and were disappearing and otherwise doing strange things! 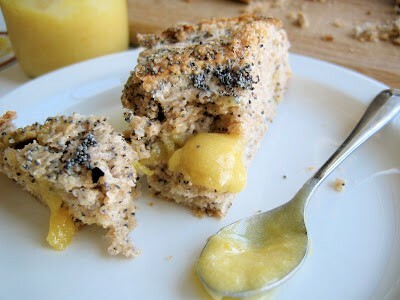 This mega scone looks amazing, and lemon curd with poppy seed? 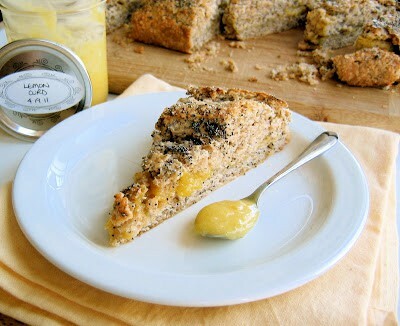 I'm just about ready to eat poppy seeds again after near-overdose a month or so ago, maybe scones are the answer! 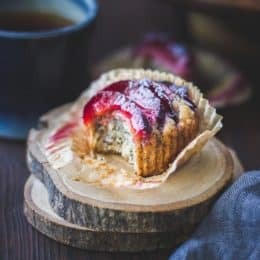 I think I know the poppy seed OD to which you are referring, and I'm hoping to try your recipe for poppy seed filled yeasted coffee cake sometime soon – it looks amazing. And I still have a ludicrous amount of seeds to use up, even after making these scones twice. 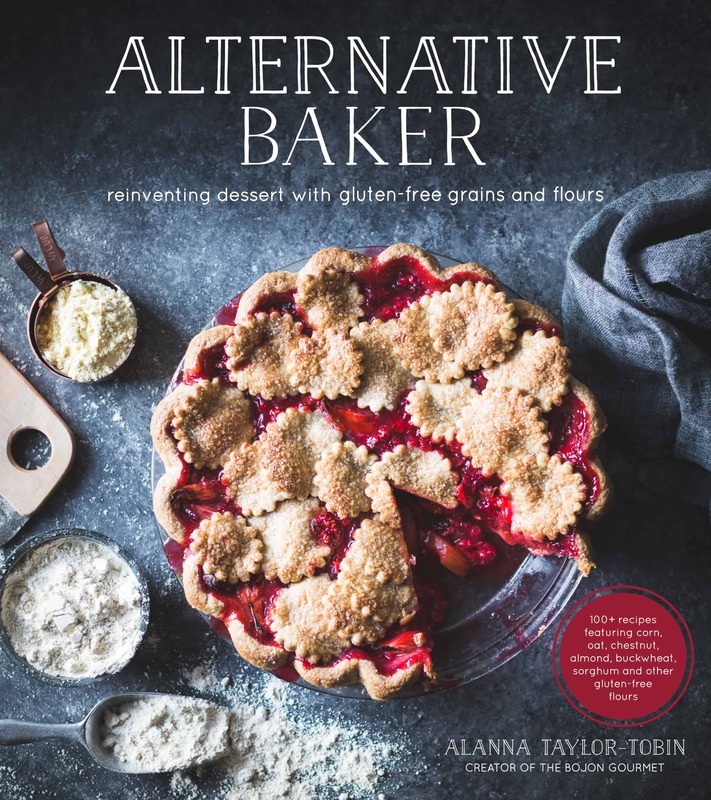 I have always wanted a VitaMix, but never knew whether to believe that you could really grind grains in them, so it's good to hear (and see on your site!) your testimonial.